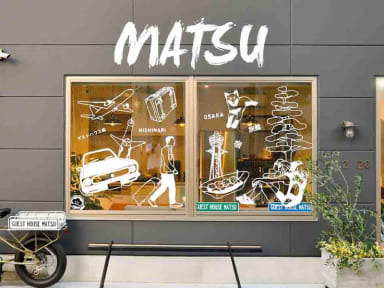 GUESTHOUSE MATSU opened in Osaka's entrance “Tengachaya” in May 2017 with the concept 'Travelers from all over the world gather and meet with a smile'. Buildings and facilities are new and clean for new construction. We offered rooms that are comfortable for our guests at reasonable prices. From JR Osaka station and Umeda station on each subway line / Hankyu line to Hanazon-ocho station near Matsu is about 15 minutes by subway. From Kansai International Airport, it is unnecessary to change trains when using the Nankai Line.Tengachaya station nearest to MATSU is about 50 minutes away. From MATSU, 2 stops by train to center of Osaka “Minami” Namba and Tennoji area. It is also capable of moving in the bicycle rental (500 yen / day) or on foot. MATSU has a shared space on the 1st and 3rd floors, the rooftop, from the thought that people want to deepen mutual exchange among guests. Please make friends with travelers gathering from all over the world. * Shared space is available 24 hours, but please be quiet after 11 pm. At MATSU, 'Takoyaki Party' is held once a week on Friday or Saturday! If you are staying over the weekend, please participate. We have four types of rooms, 'Mixed Dormitory', 'Female Dormitory', 'The Room for Family or Group (for 1 to 6 people)”, 'Twin Room (for 1 to 3 people)'. Power strips and bed lights are available in all beds. Shower, toilet, washbasin, kitchen space will be used in common (Only female dormitory has shower, toilet and washbasin in the room). * When your arrival is delayed, please be sure to contact us in advance. We will respond to late check-in at no cost, but if you do not contact us in advance and it will be over the expected arrival date (midnight) you will be treated as a no-show. * If you do not have a padlock, we will lend it free of charge. * There is 24 hours Laundromat next door. Laundry detergent is sold at MATSU (30 yen per serving). ★ We will accept it until 10 pm on the day of the accommodation day. The following cancellation fee will be generated 3 days before the date of use. ★ Luggage storage on check-in date is possible from 9 am . We accept receipt by post and deposit after the next day of checkout free of charge. I loved this hostel! Clean, great location, good beds and very helpful staff.